Not everything about custom commercial printing and printed media is glamorous. A lot goes on before the glamorous, visual impact reaches the target audience . Business cards, brochures, sell sheets, presentation folders and the like begin with creative concepts but don’t materialize out of thin air after all. That’s where the unsung heroes come in, the workhorses of the print industry that translate creative marketing visions into tangible results. Die Cutting, Gluing and Boxing services from Southern California Graphics allows you to do everything in house without having to worry about any additional outsourcing while having the piece of mind that your print marketing project will be fulfilled all under one roof. We have invested in top of the line technology and hired some of the most reputable craftsman within the field. You will find our Los Angeles Die cutting and gluing process is superior to any of our competitors. Southern California Graphics is a premier, custom-printing firm in Los Angeles who has been using die cut to their customers advantage for many decades. Die cutting is a manufacturing process used to fashion large numbers of the same shape from a given material, and sometimes several die cut components are assembled together to create a complex finished product. Many consumers find it easier to understand die cutting as a cookie-cutter process. Creating dies is very meticulous work and the design must be efficient so that the material being used is cut with minimal waste. Be cautious when selecting a commercial printing firm since these finer technicalities can affect budget as well as the caliber of the finished product. Die cuts can be done on a variety of materials including paper of all sorts of finishes and weights, cardboard as in the case of packaging boxes, or even foam and cork depending on the demands of the project. As the premier, custom commercial print shop in the greater Los Angeles area, Southern California Graphics offers extensive die-cutting services, encompassing folding-gluing, foil stamping, and production of packaging boxes. Southern California Graphics is the gold standard by which to judge any other commercial printers. 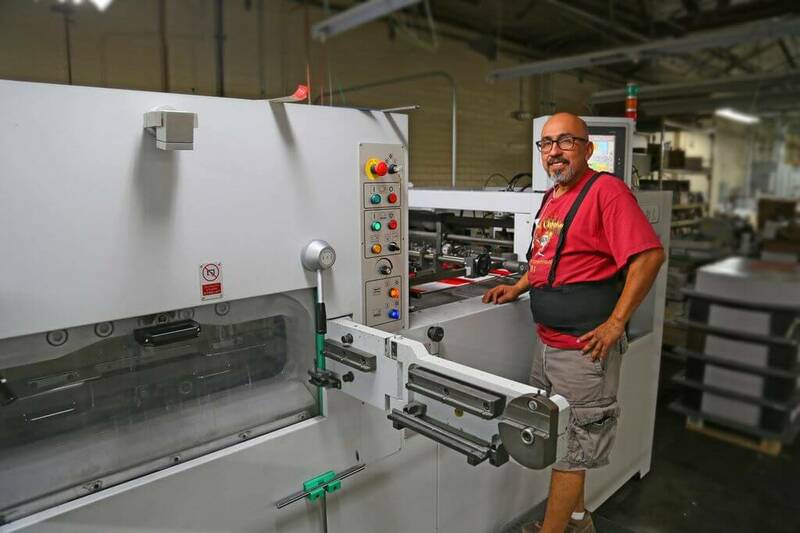 Their die cutting and gluing solutions will enhance all of your print marketing strategies not only because the team at Southern California Graphics has a talent for design, but also because they have invested in the latest technology and equipment. Partner with Southern California Graphics today and allow them to create print projects that are only limited by your imagination. Die cutting, gluing, and foil stamping can elevate a simple piece of collateral print into an impact statement for your brand messaging. And don’t overlook box packaging as another opportunity to represent your brand effectively. Southern California Graphics has a custom solution to fit your budget and knows how use the die cutting and gluing workhorses to dazzling advantage. We have invested in some of the best technology to offer Los Angeles premium Die Cutting and Gluing services in house. By investing in the new equipment we are now able to control even more of your print experience. We will provide you with more information about our new die-cutting services in the coming days, but upon the new launch of the website, we wanted to make it clear that we do offer die-cutting and gluing solutions in conjunction with our print marketing solutions. Southern California Graphics has just recently invested into die-cutting, gluing and foil stamping to expand our print marketing services. Southern California Graphics is now able to die-cut sheets up to 28″ x 40″. Our folder/gluer folds and creates pocket covers, presentation folders and packaging boxes. With the combined experience and talent we have acquired allows us to produce and maintain great quality. Give us a call and ask us to see our portfolio of work.